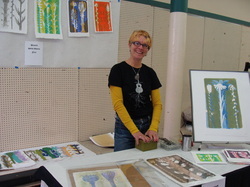 the gelatin monoprint process - laura dunn ART Work Live with ART~! The gelatin monoprint process is very spontaneous and direct with immediate results. I am thrilled to find that I can work for hours unhindered with freedom and clarity. 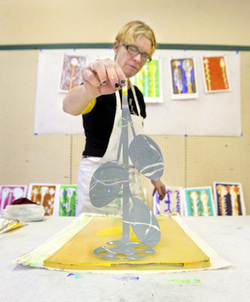 There is no need for a press so, unlike tradition printmaking techniques, this method can be done anywhere. My monoprints are all made using acrylic and/or latex paints on a specially formulated cotton linter paper. I began creating gelatin monoprints in September of 2010 after a long period of mourning and subsequent stasis in my art making. When I opened my mind to this technique, I found that once I started I could not stop and have been steadily building a body of work since. and my brother would be proud of me.